It was late evening. I’d been in leaky waders all day and didn’t want to put them on again. So I was standing barefoot, knee-deep in the icy waters of an arctic river flowing across tundra toward the Chukchi Sea. My shins and ankles ached. My feet were numb. But at the moment, I was not aware of the pain. My heart was pumping with adrenaline because I’d just seen that the big fish at the end of my fly line was not another chum salmon, but my first ever sea-run Dolly Varden trout. That is, it would become my first if I could land it. I’d been fighting it for a few minutes, without much progress, and not completely sure what I’d hooked. But then it went aerial, showing off its silvery green sides and bright magenta spots, and my hopes were confirmed. I was at the end of my first full day north of the Arctic Circle. The afternoon before, I, my friend David O’Hara, and my nephew Michael, had taken a commercial flight from Anchorage to the small city of Kotzebue. After a long fog delay, a local outfitter had then flown us inland in his small bush plane. 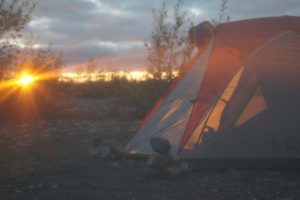 He dropped his fat-tired vehicle down on a riverside gravel bar that served as a 75-yard long landing strip, dumped us out with our camping gear, provisions, bear spray, and shot-gun loaded with slugs, and told us he’d be back in three days to get us—weather permitting. I had come to the river to research a book on Alaskan char, and some of the environmental problems now threatening them. Like brook trout, their Vermont cousins, Dolly Varden are not true trout; they belong in the char genus Salvelinus along with two other native Alaskan species: lake trout and arctic char. The most ubiquitous and adaptable of the Alaskan char, Dolly Varden have a evolutionary history almost as interesting as their name—which comes from a character in a Charles Dickens novel. Originating in Japan or eastern Russia, they most likely found their way to North America along the land bridge formed during the last ice age. Some turned north and made their way along the coast of what is now the Chukchi Sea. Others turned south and found their way down the coast of British Columbia. When the populations became isolated from one other, they adapted into distinct strains or subspecies. Like brook trout of New England, they can be found in large fresh water lakes as well as small beaver ponds, in little mountain streams far from the ocean, and in coastal rivers where some move back and forth between salt and fresh water. One northern strain of particular interest has dual citizenship. 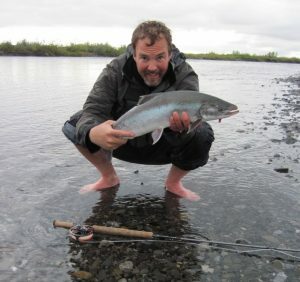 They spawn in Russia, swim out to ocean waters of the arctic getting fat on the same sort of rich diet as salmon, move back into the fresh waters of northern Alaska where they feast on the eggs of spawning salmon and overwinter, and then return to Russia to start the next generation. Or they reverse that, spawning in Alaska and overwintering in Russia. And while a Dolly Varden char in a mountain stream might not exceed eight inches, one of these ocean-going Dollies can exceed fifteen pounds, making them like the char equivalent of steelhead. As an angler, catching even an eight-pound char was appealing. But there was much more to draw me to this population of Dollies. First, they provide the basis for a subsistence lifestyle of many local peoples including the tiny coastal village of Kivalina. Livelihoods and entire cultures depend on these fish. Second, the river where we would visit was downstream of the largest zinc mine in the world—a huge scar on the otherwise pristine landscape where the Brooks Range meets the coastal tundra. A scar that on at least one occasional had resulted in a spill of heavy metals toxic to fish and their eggs. What I didn’t know when I planned the trip was that the governor of Alaska would also choose that same day to visit Kotzebue and Kivalina. And that just a week or so after us President Obama would also visit. I also didn’t know that weather—and possibly the governor’s visit—would cancel our short trip to Kivalina, though it did result in more time to explore Kotzebue, talk to folks there, and get a sense of the community. The other thing I didn’t know when I planned the trip was that, as concerned as the people of Kivalina were about the impact of the zinc mine on the health of their river, they had become even more concerned with global climate change. Which was also the reason for the visits of the governor and the president. After getting dropped off at the river, we set up our tents and surveyed the area. The large number of bear tracks, appearing on almost every piece of soft sand, confirmed that we needed to be careful. Don’t cook or store food near the tent. Don’t go into the brush alone, quietly, or without bear protection. Stay alert. Then we set off to explore along the river, examining the local plants, observing signs of other wildlife (in addition to the bear), picking wild berries. And fishing. Over the first twenty-four hours we caught several grayling, ranging from twelve to eighteen inches. They are a beautiful fish with large prehistoric dorsal fins. In the sunlight, the scales of their silver skin shimmer with red or purple. I also hooked into a big chum salmon, weighing at least ten pounds. The second largest of Alaska’s five species of salmon, they take a fly aggressively and are hard fighters. However despite their fighting spirit, they are not much prized in southern Alaska because their meat is considered inferior to sockeyes and Chinook. But northern Alaskans value them, and call them “silverbrites” and “keta”, and there is a good market for them in Japan. The one I hooked broke my line before I could bring it to shore. I hooked a second one. This one broke me off right at the bank. After a long battle I finally landed the third one, which ran close to three feet long and probably weighed fifteen pounds. Over the next two days I would land several more until I grew tired of them interfering with my fishing for Dollies. Which brings me back to the start of my story. Though it proved too large to fit in my net, I eventually landed my first sea-run Dolly Varden, a 28” long chrome-bright fish with bright red fins and spots. I would land one more slightly smaller Dolly that evening before my feet got too cold, and my nephew also landed one. That was it for the trip. The fish then disappeared back down the river, perhaps headed toward Russia. When our pilot picked us up, he sounded surprised we hadn’t caught more. But then he went into a strongly worded lament about how messed up everything was. It was the last week of August. Usually the Dollies didn’t move upriver in large numbers until September. But this year they’d come in heavy in early August and were already disappearing. The caribou seasons were also messed up. Having lived in the area for more than a quarter of a century, he’d gotten used to seasonal patterns and migrations, and had never seen anything like changes of the last couple years. Chum salmon were multiplying like crazy, but the Dolly populations were down and their seasons haywire. Which maybe was why the governor and president were visiting the same area. And why, as I would learn on my flight back to Anchorage when I got to interview a young woman from Kivalina and her grandfather, that the folks of Kivalina were so worried also. And that, much more than the zinc from the mine, seemed to be the story of the trip. That and the two big Dollies I caught. And the fact that, thankfully, I never saw the creatures who made those big prints in the sand and so I’m around to tell the story.